Blue Science transforms backyards into stunning outdoor living environments that make you proud to be a Dallas homeowner. Your family's dream of enjoying a custom pool, spa, and patio is what makes us love building pools so much! We believe the construction process should be an exciting, fun, and stress free experience. With more than 25 years in the swimming pool industry, the Blue Science McKinney team of designers, managers, and consultants deliver this experience to your pool project. You deserve nothing less. Blue Science of McKinney designs swimming pools with a philosophy that your pool should complement the architecture of your home, blend with the natural environment, and serve the particular needs of your family. We have design consultants to walk you through designing, constructing, and creating the pool of your dreams. 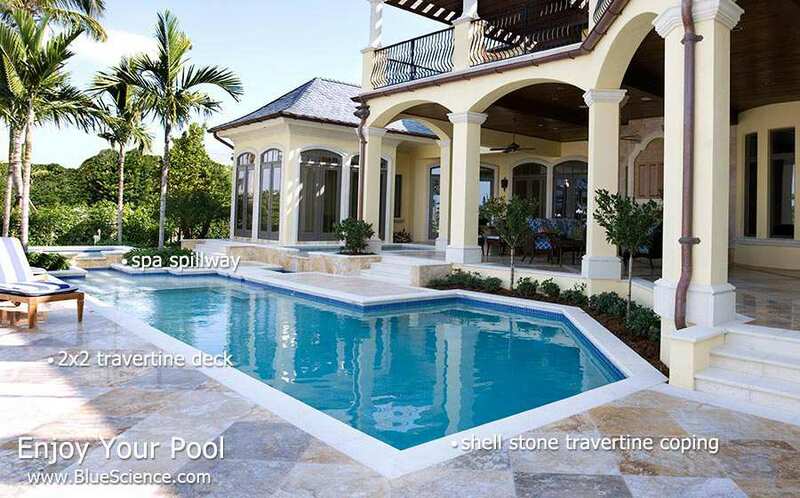 Elegant custom pool build with shell stone coping, 2x2 travertine deck, and multiple spillways. 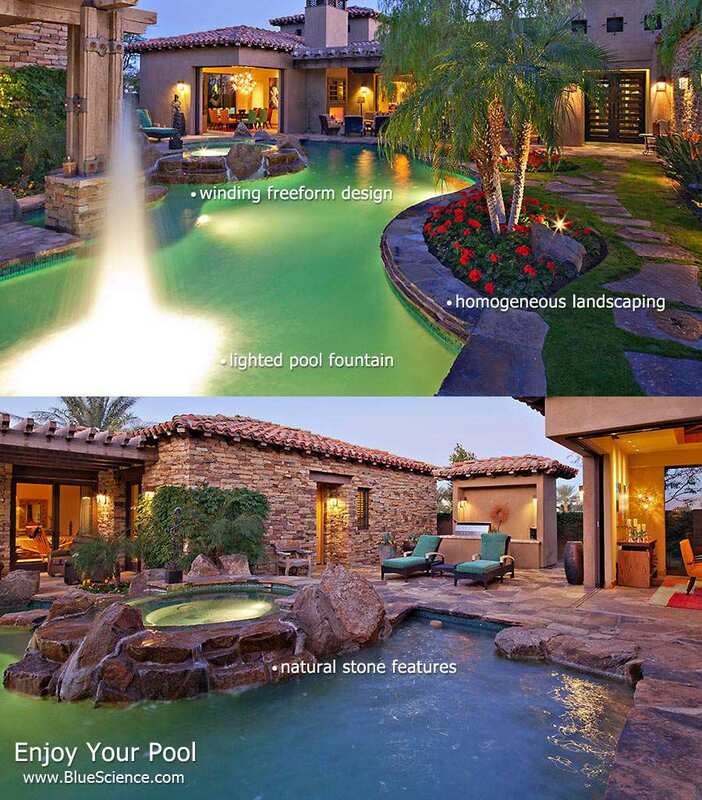 Sparkling free form pool with natural stone features, lighted fountains, and integrated landscaping. 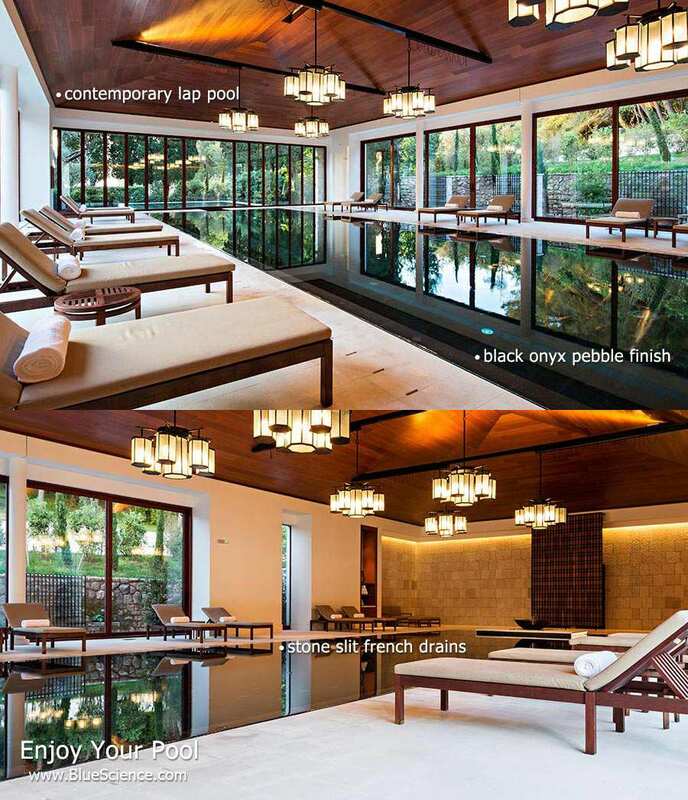 Spectacular contemporary indoor lap pool with black onyx pebble finish. Interested in a Pool Like This? Captivating pebble plaster multi-level pool with deep ocean blue tiled walls. 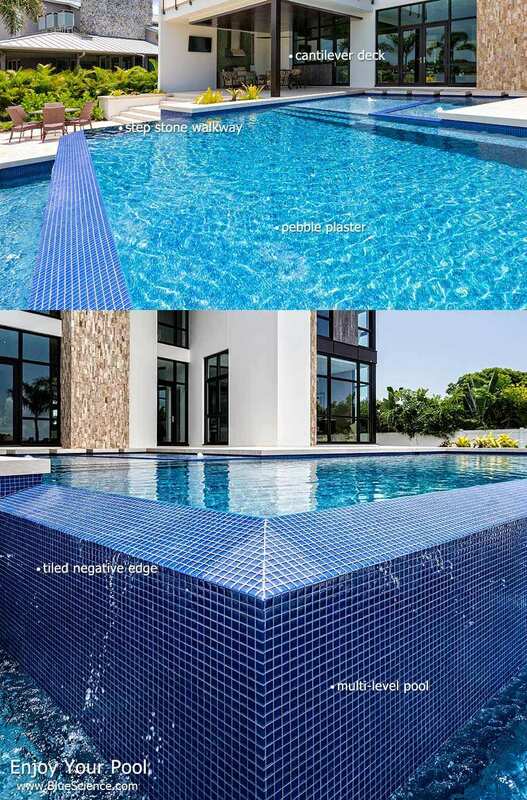 Brilliant mediterranean blue quartz lap pool with extensive travertine wall and decking. Blue Science is a McKinney pool builder that seeks to build a lasting, long-term relationship with you and to be your one-stop pool company for everything your pool needs both before and after the construction process. During construction we will be a pipeline of information delivering you guidance and leadership while being mindful of your ideas, budget, and deadline. Sometimes the most enjoyable area of your swimming pool is the surrounding area. The variety of deck and surface options available in Dallas is virtually unlimited - poured concrete, decorative concrete, colored and stamped concrete, custom stonework, pavers, travertine, and more. Choosing types, colors, and texture is an important part of the design process. McKinney residents sure do love to customize their backyard spaces. 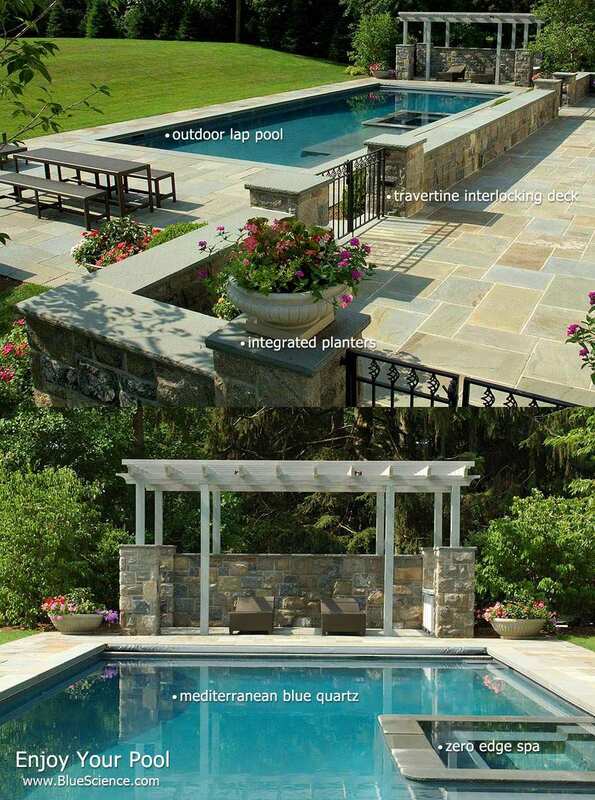 Pool features give your outdoor environment additional comfort, utility, and efficiency. Whether it's pool automation equipment to ease use or night time lighting to improve visibility, pool feature options are endless and our designers know them well. McKinney is located within Collin County, Texas. The city's population has been rapidly growing in recent years, currently having over 120,000 residents. It was named the most rapidly growing city in 2003 and 2006 with new facilities and businesses finding their place in the city. McKinney is located on the north east side of the DFW Metroplex and spans over 58 square miles. The aquatic facilities of McKinney are well maintained and include an indoor lap swimming pool, two aquatic centers, one being the notable Old Settler's Aquatic Center, and a splash park. McKinney was currently awarded in 2012 by Money Magazine as the second best place to live in America. This award was given to McKinney for the great housing, government, parks, and small businesses located here. To say that McKinney has grown for our company would be an understatement. We continually gain more and more new customers in McKinney. 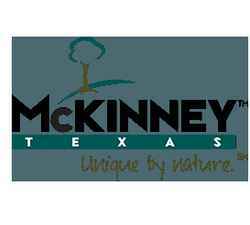 In fact, McKinney is our fastest growing area because of our strong reputation from our customers here. When providing pool repairs and equipment installations in McKinney, we use only supplies and parts from top pool companies.